Weddings are fabulous. 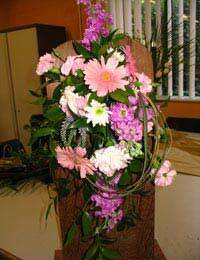 They are happy occasions and even though as a florist, you are usually dealing with a fraught bride-to-be (and her mother), the outcome will always make people smile. Wedding flowers are a perfect finishing touch that can give the day the “wow” factor and move it from being simply ordinary to simply fabulous. They are unashamedly romantic and their origins date back to the ancient Greeks and Romans, making them even more mystical and totally relevant to the occasion. The Romans use to sprinkle rose petals on the marriage bed, and regarded roses as sacred to Venus, the goddess of love, while in Greece brides always had to wear a wreath of flowers on heir heads. They are still a huge part of any wedding – they have a special place in every facet of the big day from venues to bouquets; head-dresses to corsages. But choosing the right flowers can be a minefield. Where do you start, what colours should you have, will the flowers you want be in season? Generally wedding flowers are an extension of the bride and groom’s personality and style. This goes a long way in choosing what they want. Are they traditionalist or casual? Chic or modern? The flowers should always reflect them and in this way the bride will feel comfortable and natural with watch she is carrying on the day and the groom will be happy to go along with it!! Saying that, the best thing to always do is settle on a theme and a colour. The time of year could dictate this as some flowers look their best during certain seasons. Reds and lush foliage are perfect for winter weddings; oranges and yellows for autumn; creams, whites and pastels for spring and summer. The range of designs for a wedding are huge and nowadays because a lot of weddings are done in venues other than a church, knowing how to adapt to certain styles is very important.How you would dress a church is totally different from how you would create designs for a modern hotel. Casual flowers with that “just picked” look are perfect for simple affairs while structured more bold and imposing designs fit well with larger weddings. As a florist there are lots of things you can offer a bride-to-be. Naturally there is her bouquet and if she has attendants, theirs as well. Head-dresses; buttonholes; corsages; table placements; garlands; venue decorations. The list is endless but they should all have that important common theme, colour and that little bit of something that reflects the happy colour. Wedding flower design is only limited by imagination and as a florist you are there to guide and advise. At the end of the day, what the customer wants is generally what the customer gets since they are paying for the pleasure! But as a florist doing a wedding and being expert in that particular field, most brides-to-be are happy to listen to your advice. If you are doing a wedding there are a few things you should remember! Do a site visit, if possible with the bride-to-be so you can discuss designs, colours etc? Ask for a deposit at the start and the remainder of the money at least a fortnight before. You really do need to cover your costs before the actual wedding day as some brides-to-be or their grooms can change their minds at the last minute! I should speak to the florist or the supplier from where you are buying them, beforehand. Firstly, you want to make sure they will have the flowers you require in stock. Plus, because some flowers last longer than others, your supplier will be able to give you the best advice directly.